Boxmonster? Goon? Cask? Or do you call it a bag in box? Whichever term you use to describe wine served in this format, the Winesmiths have arrived on the scene with four new cask wines to liven up the shelves. When these wine arrived, I was skeptical. But, I was going camping and thought that I would share the two casks filled chardonnay and tempranillo around as I figured they would be at least be crowd pleasing wines. Well, they would have lived up to those expectations, they were crowd pleasing. However, I did not share them with anyone and I then brought them home for my own enjoyment. In fact, I am sure that my camping friends, old and new, probably thought that I was being cheap bringing along boxmonsters. I did get a few strange looks. I feel certain that they must have thought me antisocial and unsharing. What has impressed me is that I am still drinking these wines a week on and will probably be doing so in another week. And I still want to, as is the nature of these skillfully made wines. There are funkier looking casks around if you find the wine in handbag look irresistible. The designers of the Winesmiths casks chose to go the tried and tested, more environmentally friendly route by keeping to the traditional rectangular cask made from undyed cardboard produced from 75% recycled material. In saying that, the artwork on the chardonnay and tempranillo casks that I tried are very contemporary and eye catching. Although, from the images of the pinot grigio and shiraz, these seem to fall into more gender stereotyped imagery. If I were to buy one of these, I probably would follow the Winesmiths advice and serve it in a carafe. The Hill-Smith winemaking team have the proven knack of being able to produce commercial wines with small batch attention to detail. Inside the box, the Chardonnay 2012 is fruity and creamy with fresh acid and a light spiciness to flesh out the ripe stonefruit, nectarine and citrus fruit. It is soft and well structured enough and dry enough to have more than one glass. After one week, it is still drinking well. 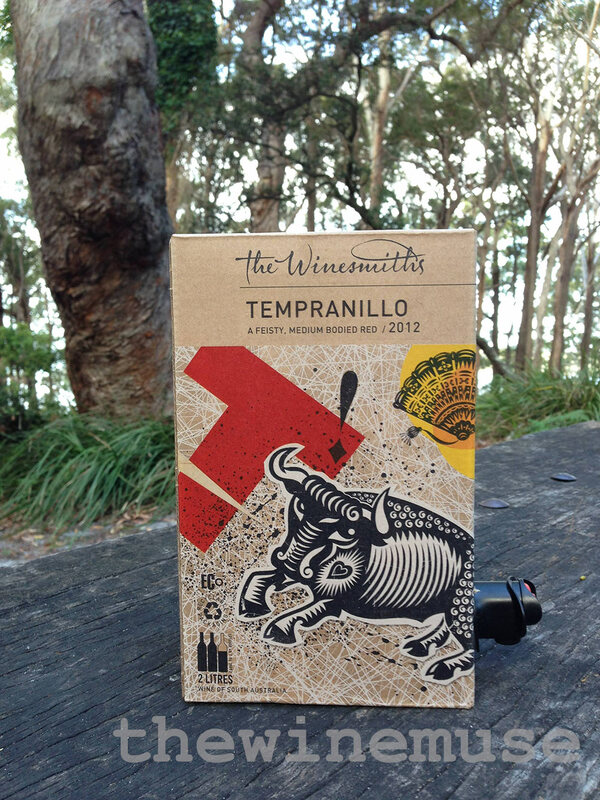 Fermented with indigenous yeasts, the Tempranillo 2012 is full of juicy cherry and red fruit flavours. It is juicy, with a tannin structure that gives support to the fleshy, soft fruit. At $18.99 for 2 litres, this works out to be about $7.10 per 750ml bottle equivalent. That is a whole lot of value delivered in a small brown paper box. These wines will challenge your perception of wines from a cask. No boxmonsters here! Available in Australia only at the moment. NOTE: After nearly four weeks, the Chardonnay is looking a little tired but the Tempranillo is spicy as ever and good drinking still! This post has also appeared on www.harpers.co.uk. 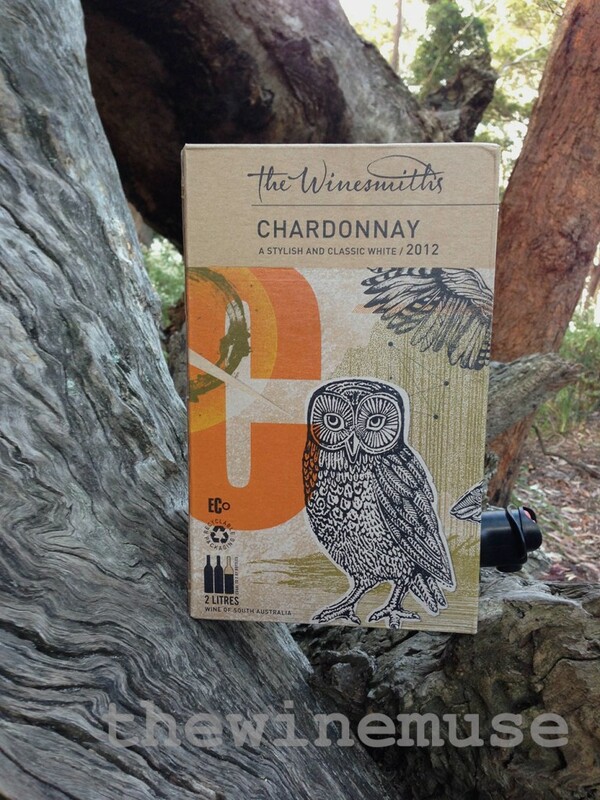 Shame ‘the winesmiths ‘ are using art work on one carton by an artist who they failed to inform. Maybe they should check out copy right before they use art without permission. The artist I refer to is ‘Geninnes Art’ wonder were they got the rest of their images from?